The second incarnation of Bel Air Bar and Grill (now owned by Walt Disney's niece), this upscale classic near the Getty Center was closed for almost two years and -- thanks to a complete renovation -- now kinda looks like a wealthy-yet-indecisive-philanthropist's home thanks to a sun-lit veranda lined with work from the Cal Arts Academy, and a dark, fireplace-enhanced study with a secret trap door to the Conservatory. Like every description ever of a George Clooney awards-show tux, food's totally contemporary/classic, and'll come from the same chefs they brought on board way back in 1998 when they used to pay them with money from their sweet Stussy jester chain wallets. 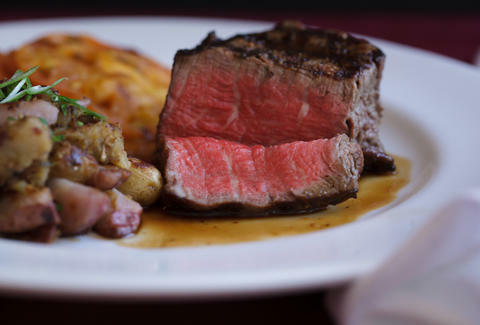 Highlights include a 10oz filet mignon that's been dipped in Port wine and sided with red potato hash (#redpotato), plus pan-seared jumbo sea scallops that are slathered in a champagne shallot butter sauce. They've also got a full bar (try the James and the Giant Peach: Jim Beam, peaches, mint, soda) as well as a to-go cafe section they're calling "The Shack in the Back", with bring-back-to-the-office-able lunchtime eats good enough to make your cubicle the happiest place on earth.